In 1977, Charles R. Modica saw his dream of a medical school become tangible, complete with campus, students, and faculty. One of these faculty members was Geoffrey H. Bourne, hired to teach nutrition, who quickly rose to the post of Vice Chancellor. In doing so, Geoffrey H. Bourne not only taught nutrition to students, but taught the administration what a University is, and how to create one. Geoffrey H. Bourne took a group of students, five permanent faculty members, and a few rented and borrowed buildings, and helped form those things into the St. George’s University we know today. This much was made clear on October 25 when the University honored Geoffrey Bourne by unveiling his bronze likeness in front of the Bourne Center. The ceremony was attended by administrators, faculty, staff, Bourne family members, Dr. Bourne’s wife, Dr. Nelly Golarz de Bourne, the Governor General of Grenada, Sir Carlyle Glean, and his wife, Lady Norma Glean, the Honorable Nazim Burke, Acting Prime Minister, and several officials from the Grenada government. Margaret Lambert, Dean of Enrolment Planning, addressed the gathering at the ceremony. She described Dr. Bourne as intelligent, diplomatic, pragmatic, kind, gracious, forward-looking and politically savvy. In his address during the dedication ceremony, Chancellor Charles R. Modica recalled his first meeting with Dr. Bourne and all that Dr. Bourne meant to him and to the university. Dr. Geoffrey Bourne was an anatomist and primatologist holding academic posts at Oxford University and was Director of the Yerkes Regional Primate Research Center before he and his wife joined St. George’s University in 1977. He came to St. George’s to teach nutrition and his wife came to teach histology, and later became Dean of Women. 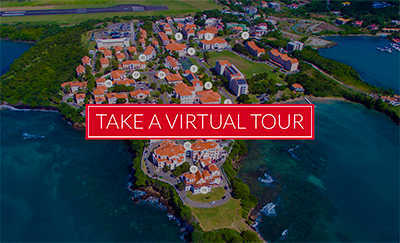 As the University’s first Vice Chancellor, serving from 1978 to 1988, Dr. Bourne established the academic credentials that St. George’s University maintains to this day. His drive to firmly shape the newly established medical school according to rigorous standards laid the foundation for the success of its graduates and track record of excellence that is an integral part of the University. 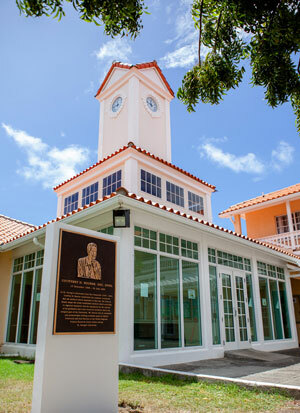 The bronze plaque erected in Dr. Bourne’s honor celebrates the man and his indelible mark on St. George’s University. To the men and women who will grace the halls of St. George’s University through the years, the plaque serves as a reminder of Geoffrey H. Bourne’s pivotal role in the university’s foundation.